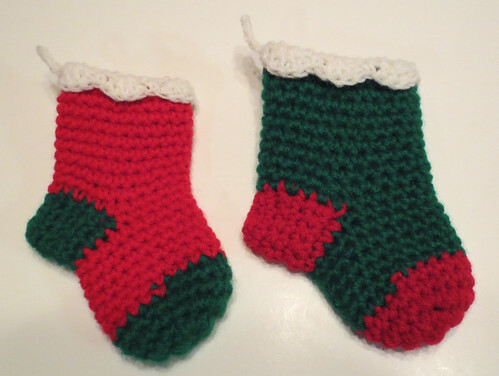 Here are several more crocheted mini Christmas stockings I made for the Warmth for Warriors drive. These stockings feature a scalloped top edging. Attach lightweight yarn at back heel edge of sock with a single crochet (SC) and skip 1 stitch. Work 4 double crochet (DC) into the next stitch, skip 1 stitch and then work SC in next stitch. Repeat pattern around and join with a slip stitch into the beginning SC. Chain 10 or 12 depending on how long you want your hanging loop. Join back into beginning stitch and weave under ends. The dark green sock on the bottom right was crocheted using ww yarn so I worked a SC, skip 2 stitches, and then worked 6 DC in next stitch and repeated around. This creates a larger scallop for the edging and seems to lay down better if crocheting the edging with ww yarn. 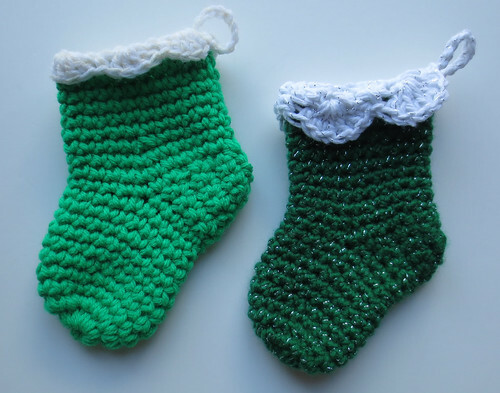 This pattern can be altered depending on what look you want for your stocking’s edging and can be used on other crocheted items such as hats and blanket edgings. The final stocking packages are being mailed off now. The final count is 1572 handcrafted Christmas stockings all filled with soaps, sewing kits, mini shampoos and/or conditioners for the troops. I know I sure enjoying crafting all the different little Christmas stockings for this worthy cause. Thank you to all my on-line friends who helped with this drive. Merry Christmas and may everyone have a wonderful holiday season!